What threats does Dr.Web protect against? The Firewall will prevent hackers from penetrating your device when you’re checking your account and making payments via online banking services; it will also protect against data and information theft. Preventive Protection will neutralise any banking Trojans and ransomware trying to launch on your device. The SpIDer Guard file monitor will prevent keyloggers from being launched on your device and stealing your logins and passwords. The Call and SMS filter in Dr.Web for Android will prevent the theft of bank SMS messages containing transaction response codes—this will prevent criminals from making transactions, instead of you. Read the Anti-virus Times columns "Online banking" and "Banknote thieves" to learn how cybercriminals use malicious programs and social engineering techniques to try to steal money. With the help of social-engineering techniques, scammers deceive Internet users by playing on their curiosity, weaknesses, and carelessness. 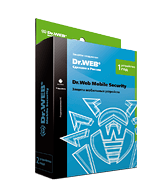 And Dr.Web protects users against scammers, using its entire array of anti-virus technologies. Anti-spam will filter out phishing emails—you simply won’t see messages sent by criminals and you won’t fall into their traps. It’s also a time saver—you won’t have to waste time “cleaning” your mailbox of unwanted advertising. The HTTP monitor SpIDer Gate will prevent users from visiting phishing sites, fake online bank or store pages, and the sites of other fraudsters, sorcerers, witch doctors, makers of miracle cures, and medical charlatans. To prevent your gaming currency and expensive artifacts from flowing into the accounts of cybercriminals, never disable the SpIDer Guard file monitor. Its continuous operation will spare both your nerves and your data. Read the Anti-virus Times columns "Con artists" and "Caught" to learn how cybercriminals use malicious programs and social-engineering techniques to try to worm their way into people’s confidence and make them willingly engage in whatever actions they need them to undertake. Vulnerabilities exist in every piece of software. This fact is well known to hackers, which is why they create exploits—special codes that exploit vulnerabilities to deliver malicious applications into a system or steal information. Cybercriminals most frequently exploit vulnerabilities in popular browsers, Adobe applications, and Office systems. Any software has loopholes. Zero-day vulnerabilities—those vulnerabilities not yet known to either software developers or even anti-viruses—are particularly dangerous. Dr.Web Process Heuristic technology will analyse the behaviour of each running program in real time by comparing it with the reputation information stored in the Dr.Web cloud, which is constantly updated. It will determine whether a program is dangerous and then take whatever measures are necessary to neutralise the threat. Dr.Web ShellGuard technology will detect when malicious code attempts to exploit a vulnerability and terminate the attacked process immediately, thus preventing the exploit from running. The Dr.Web heuristic analyser will use its knowledge (heuristics) about certain properties typical of viruses to stop an exploit. In May 2017, during a virus outbreak, WannaCry exploited vulnerabilities in the SMB v1-3 protocol. Dr.Web detected the Trojan as soon as systems came under attack even though it had not yet been added to the Dr.Web virus database. WannaCry was stopped by the Dr.Web heuristic analyser which has been perfected and upgraded since 1994. No Dr.Web user’s data was compromised. Each of us values the fruits of our labours and our family photos and movies. But for hackers, such files are their key to getting rich. The Data Loss Prevention feature will keep your most important information safe, constantly protecting it from tampering or deletion. The Ransomware Protection module prevents encryption ransomware from being launched in a system; this will protect users from blackmailers who demand a ransom for data recovery. SpIDer Guard will instantly neutralise any attempts made to steal files from your device. The Devices component will make it impossible for anyone to connect to your network-connected devices, which means it will be impossible for them to record information from your computer. Read the Anti-virus Times column "Persona (non)grata" to learn how cybercriminals profit off of user data and what malicious programs they use for this purpose. Dr.Web believes: A computer should serve its user rather than invisible intruders who can utilise the machine's resources remotely for their shady dealings. That’s why Dr.Web developers pay a lot of attention to providing protection against hijacking and spying. Miners are quick to use other people’s computers for personal enrichment, an activity known as crypto mining. Dr.Web protects computers against such break-ins and does not let cybercriminals use your system resources. Your computer will remain yours! Today criminals gather infected computers into remotely controlled groups known as botnets. This lets them carry out massive attacks that result in denial of service; such attacks can be ordered against companies by their competitors, and against military facilities and infrastructure-critical institutions. When such attacks are being investigated, your computer may be disconnected from the Internet or confiscated for investigative purposes. Use Dr.Web if you don't want your device to become part of a botnet. Devices disguised as removable media can “burn” part of a computer or intercept data. Use the Devices component and block such attempts. Cyber spies have different goals in mind when they monitor users: blackmail, extortion, revenge... And sometimes it’s just for fun or because of various mental disorders. The Privacy component will block hacker attempts to use your microphone or camera. You will be able to work at your computer without having to worry about your photos getting published on the Internet or the results of a meeting becoming known to your competitors. Read the Anti-virus Times columns "Spies are everywhere" and "Botology basics" to learn how cybercriminals try to steal money and spy on users with the help of malicious programs. Children constitute a special group of Internet users that is most at risk due to inexperience, credulity, curiosity, and other age-related qualities. Therefore, the ways of protecting children on the Internet are special too. Parental Control will prevent children from visiting websites that can have disastrous psychological and moral impact; it will keep them from communicating with scammers of all stripes, criminal elements, and mentally disturbed people. Filtering sites according to thematic groups will block children from accessing websites their parents deem inappropriate: social media sites, gambling sites promoting violence, etc. Parents can restrict access to their documents and make it impossible for their children to view information intended for adult eyes only. Dr.Web gives parents the ability to restrict online time so that their children aren’t engaging in health-harming, excessive Internet use and are spending more time on their studies, interacting with peers, and engaging with the world. Read the Anti-virus Times columns "Snared in the net", "Web psychology", and "Kids’ web 2.0" to learn how the cyber world of a child is fragile in our hi-tech era and why it needs parental protection. 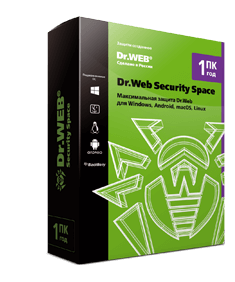 Dr.Web Security Space provides sufficient protection for safe web surfing. Only if users do not lower their Dr.Web protection level (by disabling or suspending a module’s operation, lowering the protection level for the Preventive Protection component for short-term convenience, etc.). Scans web pages in real time and blocks access to dangerous sites, such as those used for phishing attacks. Protects against malicious objects that take advantage of software flaws in popular applications. Trojan-encoder protection based on behavioural rules for programs of this kind. Continuously protects files in user-selected folders from unauthorised tampering or deletion (disabled by default). Blocks a device’s camera and microphone to prevent unauthorised audio and video recordings. Blocks access to removable media: flash drives and any other USB device, including webcams, cameras and portable media players. Users of this product receive our gift—free protection for Android! Click on a component’s icon to learn about its features.